The newly build Hilton Amsterdam Airport Hotel exists out of 433 hotel rooms, a restaurant, a spa and fitness, a conference centre with facilities and a ballroom for600 people. Under the hotel an underground parking of one floor is realised. 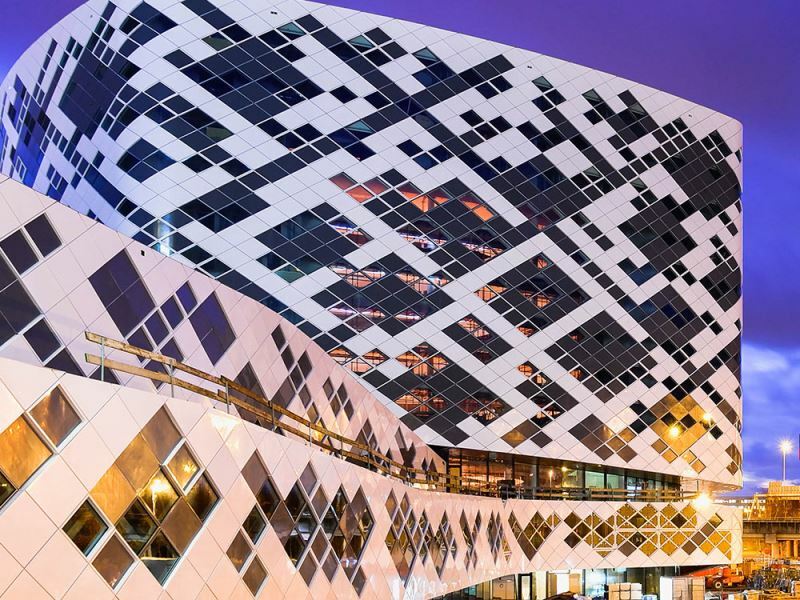 The hotel is directly connected with the passenger terminal and situated close to the old Hilton Hotel, the Schiphol Boulevard - a shopping area - and the World Trade Center (WTC). 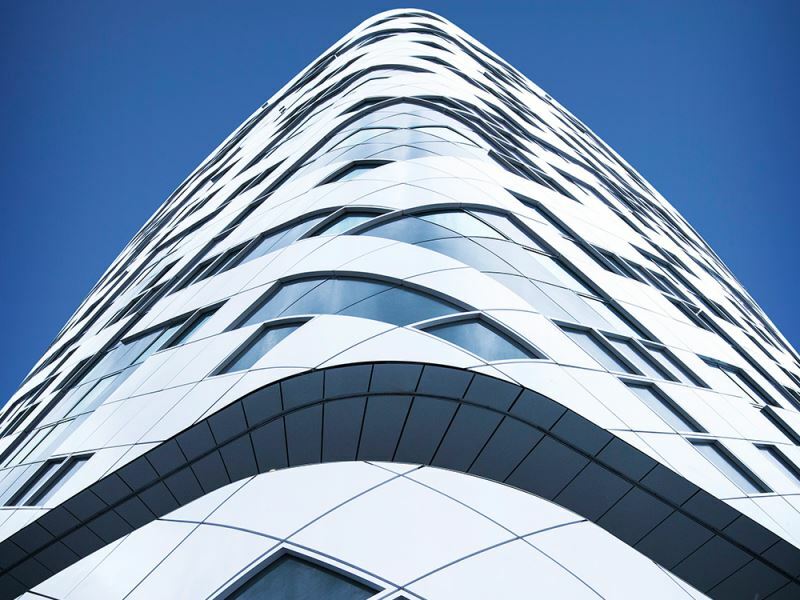 Architect Mecanoo designed, for the new Hilton Hotel, a facade with diagonal lines. From the ground floor a notch follows the line of the building, giving it architectural allure. The 433 hotel rooms are situated around an inner courtyard. To be able to construct such a large open space inside the building, ABT engineers enabled the walls of the structure to find the support they needed within the structure of the building itself. As a result, the walls, like in conventional construction, don’t need a support inside the building. 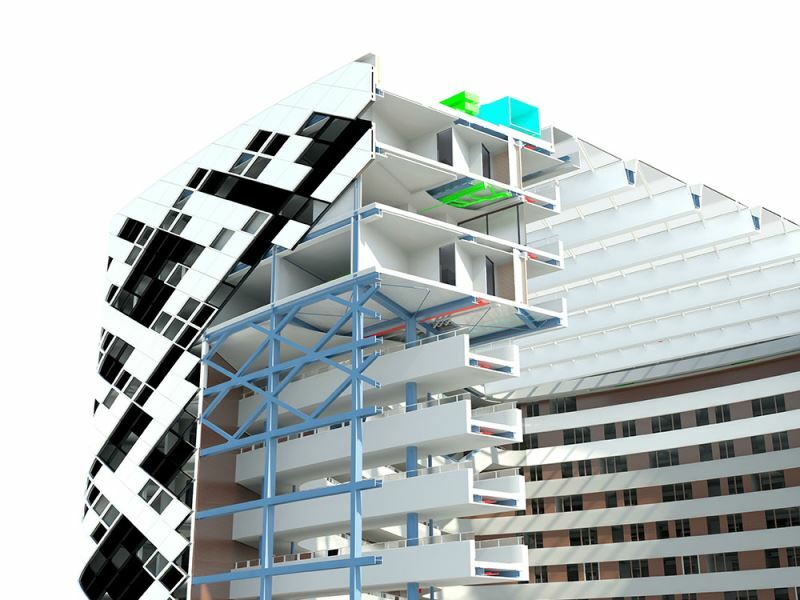 A BIM-model is used to engineer the architecture, construction and geo-technic of the building and create a complete image in an early stage of the design and construction process. The inner courtyard is also exceptional. It is lit through the glass roof at the top of the building, 42 meters from the ground, and through a large window at the north facade. The window covers seven floors, from the second until the ninth. Above the window ‘float’ three floors with hotel rooms. Having only one column for support, these floors are being kept in place by a supporting grid integrated in the walls of the rooms and balance their weight partly with the construction of the building. ABT was responsible for all the necessary calculations for this construction and consulted on the foundation and excavation of the building site. The ‘balancing act’ with the upper three floors of the building wasn’t just a challenge for the ABT-engineers. The building parts only found stability at the end of the construction process. As a result, the construction company Ballast Nedam Bouw & Ontwikkeling B.V. had to balance the building parts during the construction process. To make this possible, the contractor worked closely together with the engineers of ABT. 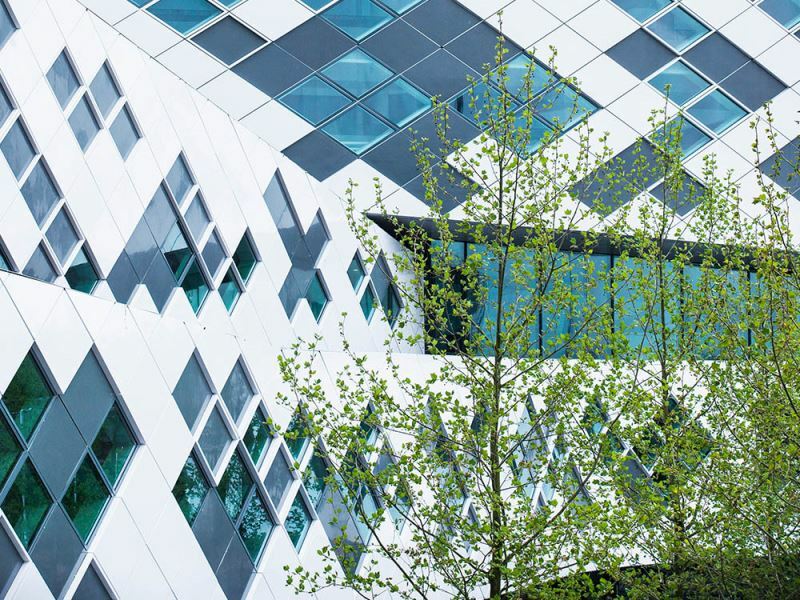 The sustainability ambition were high; for the new hotel building the client wanted a ‘Excellent score’ based on the BREEAM-NL sustainability scale.